Sam Turner with the Red Bank team competes in the Superintendent's Match for JROTC rifle teams at Red Bank High School on Saturday, Feb. 3, 2018, in Chattanooga, Tenn. Teams from across the region vied for awards presented by Hamilton County Schools superintendent Bryan Johnson. In some Hamilton County classrooms, students shoot rifles — air-soft rifles. As part of the national JROTC (Junior Reserve Officers' Training Corps) program in high schools, students have the opportunity to join special teams including color guard, drill, academic, athletic and rifle teams. On Saturday, nine Hamilton County high school rifle teams competed in the 33rd annual Superintendent's Trophy Match, but one JROTC program was missing — Hixson High School. "We are the only JROTC school in the county who doesn't have a rifle team" said Hixson JROTC instructor Col. Scott Campbell. "My goal is to secure a shooting range. It's a pretty lofty goal, to be honest." After receiving approval from the Hamilton County school board in January, Hixson High School seeks a grant from the National Rifle Association to build a joint-use marksmanship range at the school for the JROTC program and the school's archery team. Organizers also hope the grant will fund equipment and start-up costs needed to create a rifle team. "Our kids like to compete, because that is part of growing and learning about yourself," Campbell said. " I want to be part of that competition and so do my kids. We just want to afford them every opportunity we can." Of the county's 10 schools with JROTC programs — Brainerd High, Central High, East Ridge High, Hixson High, The Howard School, Ooltewah High, Red Bank High, Sale Creek Middle/High, Sequoyah High and Soddy Daisy High — many of them have JROTC facilities, complete with shooting ranges built into the school. Central High School, which houses one of the oldest continually- active JROTC programs in the Southeast, according to Col. Thomas McConnell, director of Hamilton County's JROTC programs, has a shooting range built for when JROTC cadets still shot actual ammunition from live rifles. "JROTC facilities are generally built when the school is built to accommodate what is needed and what the school wants," said McConnell, who has worked in the district since the early 1990s. "Full-fledged ranges would have been built then." Some schools clear out classrooms or set-up portable targets in the school's gymnasium or cafeteria when students practice, though. Brainerd High does not have it's own range, which means the rifle team cannot host any of its competitive matches. Sale Creek Middle/High, one of the district's top-performing teams, houses its range in temporary buildings behind the school. "We are all competing for resources," Campbell said of Hixson High's need for space. The NRA grant application, which was also approved by Hixson Principal Lee Sims, Superintendent Bryan Johnson and Chief of Schools Justin Robertson, is for $675,000. The application requests funds for a 5,770-square-foot facility, with an estimated cost of $110 per square foot. Currently, Hixson's archery team, which is coached by the school resource officer, uses the cafeteria for target practice. The facility would be a joint-use public facility, as most school facilities are, and could be reserved for public use. 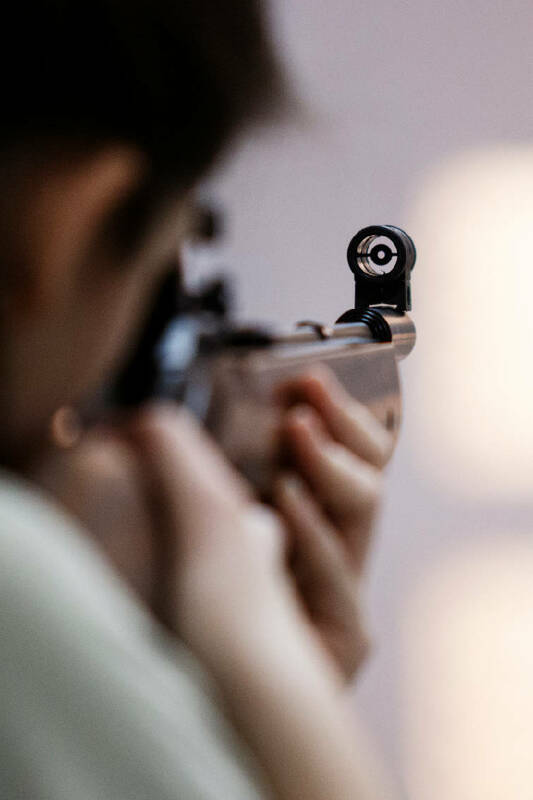 "Learning through marksmanship offers critical safety aspects needed for weapons awareness, competitions, awards and contests, a pathway into other courses, potential scholarship opportunities and much more we want to explore," the application reads. "Many of our cadets join JROTC to be a part of something bigger than themselves." About 12 percent of Hixson High's student population is part of the JROTC program, Campbell said. Several years ago, the district's only Air Force JROTC program was at risk of closing. The cadets failed an official inspection, which put them on a short list of programs to be cut from the Department of Defense's budget. Since then, Sgt. Doug Burhans and Col. Campbell joined the school, and this year the program boasts more than 100 students. Though many aspects of JROTC are identical to the actual service branches, high school JROTC participants are under no obligation to join the military after high school. The goal is instead to teach them citizenship and help them become better citizens, said Lt. Col. David Storey, Sale Creek's rifle team coach and JROTC program instructor. "You introduce them to doing something for someone else," Storey said. Central High senior Matthew Frazier said he felt his experience in JROTC was valuable no matter what. Every JROTC program includes a curriculum component which fulfills students' elective credits at school, as well as special teams outside of the rifle teams. Every program in the county has a color guard and drill team, academic teams and raiders, or athletic and leadership-geared competitive teams. The school district, which staffs McConnell at the district level, also funds half of each instructor's salary. Most schools have two or three instructors. The service branch funds the remainder of the salaries, as well as all of the uniforms, equipment and other supplies needed. When the district started the JROTC program at Sequoyah, start-up costs for Hamilton County Schools was about $70,000, according to McConnell. Every branch but the Air Force also provides the equipment for rifle teams — which is why Hixson's grant includes estimates for rifles and targets. Though such a grant application is not typical for the NRA, according to McConnell, the school should get a decision by this fall. An actual facility would not be built for several years. Hamilton County Schools has 10 JROTC programs — eight Army programs at Brainerd High, Central High, East Ridge High, The Howard School, Red Bank High, Sale Creek Middle/High, Sequoyah High and Soddy Daisy High, one Navy program at Ooltewah High and an Air Force program at Hixson High.